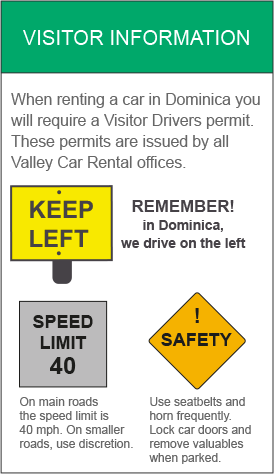 Wherever you plan to go during your visit, Valley Car Rental Dominica would always recommend a four wheel drive vehicle on our mountainous island! We offer a range of quality compact and mid-sized 4×4 Jeeps, SUVs and buses to suit your every requirement and budget. Our vehicles are all air-conditioned and equipped with power steering. All Valley car rental vehicle rates are exclusive of 15% tax and Collision Damage Waiver (CDW), and are subject to change without notice. Competitive CDW rates of $8-$10 USD/ day and Long Term car rental rates are also available. 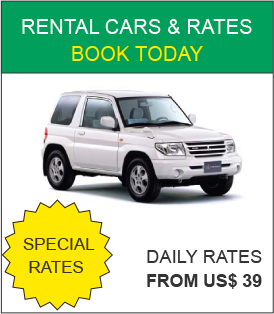 Contact us today to receive the best car rental vehicle rates in Dominica.